It fixed the issue, but I didn’t dig much further. However, over the last few weeks I’ve seen many similar leaks reported on StackOverflow, so I’ve finally decided to get to the bottom of the problem. To diagnose a memory issue, the first thing to do is to have a repro case. It must be as simple as possible and have no random components, to be able to focus on the issue. Basically, it calls the garbage collector, display the total memory usage, wait a while (to avoid triggering any anti-leech protection from the website), load the picture, then back to step one. The XAML part just contains an Image control called “MainImage”. After only nine pictures, the app crashes with an OutOfMemory exception. Good! Now let’s try to find out what’s going on. First of all, the workarounds. The two I know are : loading a dummy picture (as explained in the introduction), or setting the UriSource to null. Let’s try both. The curves are really similar, in both case we’ve stopped leaking memory (at least: large amounts of memory). Now the problem is: we obviously shouldn’t have to use workarounds. Is there another way? After a bit of trial and error, I found something that I really wasn’t expecting. Removing the ImageOpened and ImageFailed event handler fixes the leak! Now, we know that the leak occurs when not removing the ImageOpened and ImageFailed event handlers. The problem is: it shouldn’t happen. As a quick reminder, the garbage collector works by keeping track of what is called “GC roots”. Those are references that can’t be collected: for instance, static variables. Then, the garbage collectors browses the objects referenced by those roots, and the objects referenced by those references, and so on. After recursively browsing the reference tree, all objects that weren’t found are freed from the memory. In our case, the PhoneApplicationPage object is used by the application, and therefore won’t be freed. Therefore, when an object is referenced by the page, it won’t be freed either. On top of that, we’ve got event handlers. Event handlers are a frequent source of memory leaks. Imagine we’re creating an object called “ChildObject”. We assign a method of this object, called “SomeMethod”, to the “Loaded” event of our page. Then, even though we’re not referencing this object any further in the code, the object is still referenced by the page (through the event handler) and will be kept alive as long as the page is alive! Is that our problem here? No, because we’re assigning a method of our page to the ImageOpened and ImageFailed events. The BitmapImage is keeping a reference to our page, but not the other way around. So the BitmapImage is keeping the page alive, but the page shouldn’t keep the BitmapImage alive. The cause of our leak must be elsewhere. The finalizer is called. So even though we’re leaking memory, the ChildObject is freed. Which means that the BitmapImage is freed as well! The finalizer isn’t called anymore. We’ve proven that the BitmapImage is indeed cleaned by the garbage collector. So what are we actually leaking? Maybe the memory profiler can tell us? … Nothing. 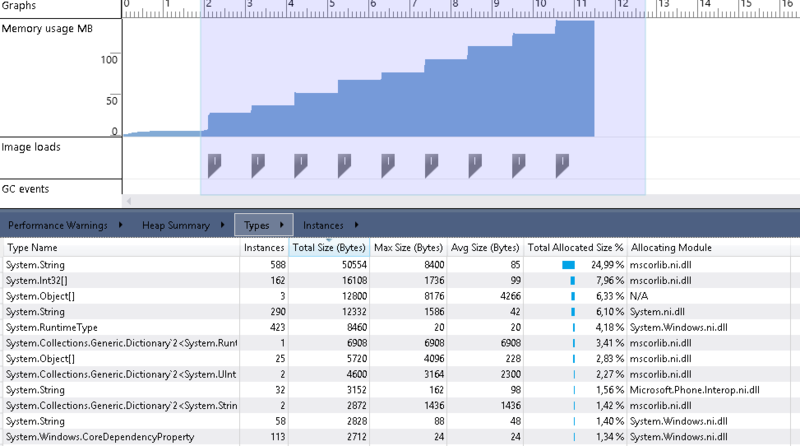 Which means we’re probably leaking native memory (the profiler only shows managed memory, .NET objects that is). There’s nothing more we can do with Visual Studio. It’s time to start Reflector and decompile the framework’s assemblies to try to understand what’s happening. We know the leak is centered around the event handler, so we can directly go and see what’s going on there. Removing the event handler fixes the leak, so let’s see what is in this “RemoveEventListener” method. The method checks a few things, then calls the XcpImports.RemoveEventListener method, and finally removes something from the “EventAndDelegateTable” dictionary. Now that’s interesting, maybe the memory is used by the dictionary? The dictionary stores instances of an internal class called “EventAndDelegate”. It only contains a reference to the dependency property and to the delegate used as event handler (in our case: the bitmap_ImageOpened method). Nothing big enough to explain the leak. Then maybe the XcpImports.RemoveEventListener method? We’re calling a method called “RemoveEventListenerNative”. As its name indicates, it’s a native method, so we can’t use Reflector to see what it’s doing. 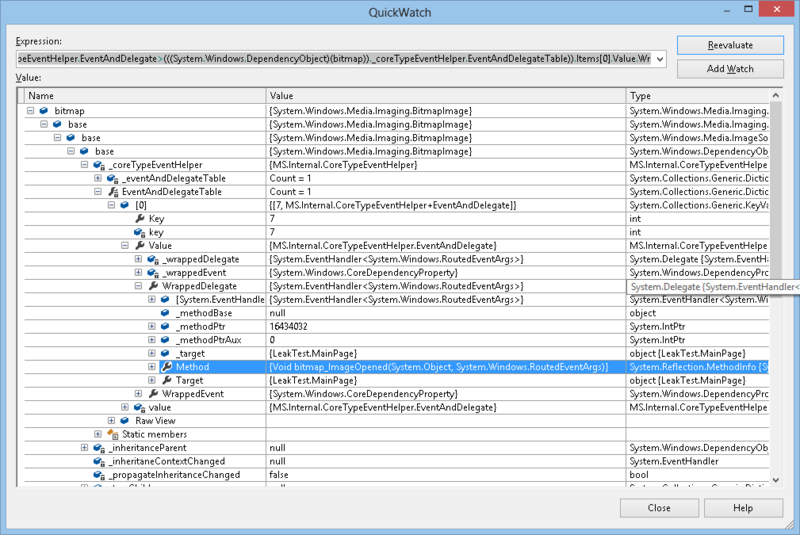 But the method receives a parameter called “obj.NativeObject”, making it a nice candidate for our leak. How to know whether it’s the source of the leak or not? By calling it ourselves! Here we find our “EventAndDelegateTable” dictionary, with only one entry: our ImageOpened event handler (I removed the ImageFailed event handler to have as little noise as possible). Then we resume the code execution by pressing F5, wait for the breakpoint to be hit again, and do the whole process once more. This time, the key is “8”, looks like it’s incremented by 1 every time. The memory usage stays below 50MB. When compared to the previous values, it becomes obvious that we’ve found the source of the leak. Up to this point, what have we found? – When assigning an event handler to a BitmapImage (ImageOpened or ImageFailed, I haven’t tested with DownloadProgress but it’s probably the same), the runtime internally keeps a reference to the picture’s native object. – When removing the event handler, the native object is freed as expected. If the event handler isn’t removed, the runtime keeps the reference to the native object, therefore leaking huge amounts of memory. This is a bug. Our code follows the .NET guidelines, and we’ve proven that the managed instance of the BitmapImage object is released by the garbage collector. So we’re not keeping stray references anywhere. What should the framework developers do? It’s hard to tell, since I don’t know how the reference is used by the native code. But they should at least consider making the BitmapImage implement the IDisposeable interface, and clean the event handlers in the Dispose method. The IDisposeable interface is the .NET way to tell the developer “be extra careful or you may be leaking memory”. In the current implementation of the BitmapImage class, there is no way to suspect that a leak will occur. What should third-party Windows Phone developers do? When using a BitmapImage, ensure that you’re removing the event handlers in every possible code path. Use Visual Studio’s Performance Analyzer and test your code with very large pictures to make sure you’re not leaking memory. And set the UriSource of the BitmapImage to null, as an extra precaution.